The Sustainable Eel Group (SEG) is the leading international organisation seeking to accelerate the conservation and management of the European eel. SEG aims for healthy eel populations, distributed throughout their natural range, fulfilling their role in the aquatic environment and supporting sustainable use for the benefit of local economies. Key to this is the collaboration of the scientific, conservation and commercial sectors. SEG initiates and supports scientific research, conservation projects and organises stakeholders’ commitment. Additionally, it provides a standard for a responsible eel sector with traceability from source to market. SCIENCE. It is the role of science in the triumvirate science-conservation-commercial, to (1) provide information on status and trends in the eel stock, to (2) quantify opportunities and threats to the recovery, and to (3) provide insights into the ongoing processes (biological, socio-economic, societal, etc). SEG aims to achieve this by initiating/supporting research projects, by advancing eel issues in research programmes, and above all, by stimulating the communication between science and others involved in eel recovery. CONSERVATION. Science-led conservation of the European eel underpins all of SEG’s work to support the Eel Regulation EC 1100/2007 for the ‘protection and sustainable use of the stock of European eel’. Our work to conserve the European eel includes: (1) Raising public awareness on the need to safeguard and restore habitats for eel, (2) Developing and running the SEG Standardensuring responsibility and traceability from source to market, (3) Facilitation and management of projects aiming to improve eel populations, (4) Advising politics, conservation and trade authorities in order to gain global protection and future sustainable use of the species. COMMERCIAL EEL SECTOR. European eel has been eaten and enjoyed since Aristotle or even earlier. In the European cultural heritage eel plays an important role. Many livelihoods including fishermen, retailers, aquaculturists and processors depend on the eel tradition. This connects them with nature and helps create a fuller understanding of what eel stewardship means. The majority of the commercial eel businesses are small to medium sized family enterprises. Eel-specific knowledge, collected over generations, is an important information source for science and conservation. The commercial eel sector is involved with SEG and is actively contributing to the recovery of the European eel stock in many ways including (1) Responsible eel sourcing in compliance with the SEG Standard; (2) Restocking suitable habitats with young eels; (3) Protecting adult eels on their migration to the spawning area by safeguarding silver eels from hydropower turbines and pumps and (4) Consumer involvement through the Eel Stewardship Fund. The ESF also funds research into captive breeding programs, which may provide a longer term solution. The Sustainable Eel Group (SEG) was formed to take action to support the recovery of the European Eel and emerged from the very successful Bridgewater conference on the eel organised and run jointly by the Institute of Fisheries Management and the Environment Agency. Many of the speakers from the conference, drawn from the leaders of the Scientific, Conservation, Policy, and Commercial sectors, gathered at Fishmongers Hall in December 2009 and made the commitment to work together around a shared vision of the eels return to abundance and so SEG was formed. Today SEG memberships are drawn from across Europe. Provide the respected leadership alliance that enables and promotes the joined up conservation and management of the eel in the Member States of Europe and beyond, linking all interests in an open and effective process to achieve SEG’s Vision. SEG’s vision leads to the definition of its aspirational goal. SEG recognises that this definition is subject to considerable scientific uncertainty in relation to both current and historical eel populations, but considers that it provides a clear long term goal, well-aligned with regional policy objectives and sufficient to guide SEG’s programmes and activities at the current time. Healthy Water Habitat/Aquatic Ecosystems: defined as functionally intact water flow to support habitat for fish and vegetation, water quality, and ecosystem health, where natural residence of elvers, natural escapement of silver eels as well as free migration between the waters themselves is possible. A Sustainable Eel Sector : defined as an eel sector that produces a fully traceable product, is financially viable, and is compatible with the achievement and long-term maintenance of healthy wild eel populations and provides a positive net impact on eel populations. A healthy water habitat is an obvious pre-requisite to achieving SEG’s Vision. Eel populations have been decimated by the destruction of wetlands, damming of rivers, and deterioration of water quality, and without major improvements to all these factors healthy wild eel populations will never return. Equally clearly, a healthy eel sector is dependent on a healthy wild eel population. To date it has proven impossible to breed eels in captivity, despite more than a century of effort. Without a healthy, self-sustaining wild eel population, there is no eel industry, no recreational fishing for eels, no eel culture and no market for sustainable consumption. The motivation for the sector to support the restoration of eel populations is clear. But it is only in the last decade or so that the sector’s potential to contribute has become clear as well. Illegal trade in eels is a major threat to the restoration of healthy eel populations, and so a major threat to a sustainable eel sector. Reputable eel fishermen and traders can be powerful allies against the illegal trade. Eel aquaculture or ranching is completely dependent on the capture of wild stock. Changes in fishing methods can have dramatic impacts on the mortality of eels for live trade. The capture of live eels can be the basis for restocking partially restored habit – but this will only make a contribution to the restoration of populations if the capture and translocation is legal, regulated and follows the highest standards. And habitat restoration and effective regulation cost money, and need political support – a motivated eel sector can contribute both. SEG’s role is to bring together all stakeholders who believe in a future for eels, to help achieve its vision. This is SEG’s Theory of Change. The SEG Theory of Change is a living document and is designed to be flexible to integrate learning and continuous improvement. The following graphical illustration summarizes the SEG Theory of Change. A more detailed internal version will be developed for monitoring and evaluating progress, and SEG’s effectiveness in achieving its vision over time. 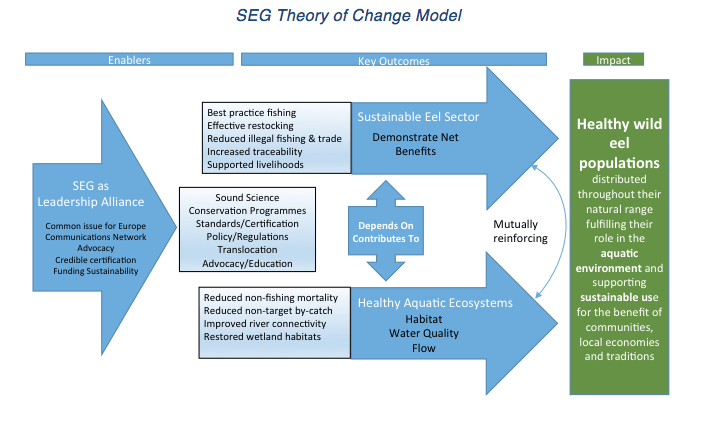 SEG’s Theory of Change provides the underlying logic for SEG’s strategy and priorities for action focused on achieving SEG’s two high level outcomes: the restoration of healthy aquatic ecosystems, and the development of a sustainable eel sector. Ensure the full traceability of eel products from fisher to plate or re-stocked habitat. Support the establishment of (eel) fishing free periods, quota, areas or zones. Rationale: Achievement of the long-term vision requires an organization that has the infrastructure and viability to sustain and scale up its long-term impact through partnerships and networks. SEG serves as the convening platform across diverse stakeholders and competing interests, with the Eel as a flagship/sentinel indicator for healthy water ecosystems. Through its commitment to strong, multi-stakeholder governance, and focused and effective programmes, SEG will earn the legitimacy to provide leadership in the achievement of its vision. Rationale: The Eel is present across the EU with SEG unifying the different interest groups on collective impact. SEG places an emphasis on multiple stakeholders and coalitions between science, conservation and industry interests for the benefits of aligning the goals and addressing major threats to achieving the objectives of river connectivity and healthy aquatic ecosystems. Cultural and political differences are addressed through country networks to address contextual and localized issues, in particular the blockages to freshwater eel migration pathways including dams, weirs, gauging stations, flood defenses, water pumps and hydropower. The sector can play a significant and measurable role in encouraging solutions to water management and pollution. In addition the fishery sector can help promote the meeting of many key measures from the European Eel Regulation. Rationale: The objective of the SEG Standard is to maximise the contribution of eel fishers, ranchers, aquaculturalists, traders and consumers of eel products to the restoration of healthy eel populations, distributed throughout their natural range, fulfilling their role in the aquatic environment and supporting sustainable use for the benefit of communities, local economies and traditions. Requirements specified in the SEG Standard will be designed to ensure that implementation of the SEG Standard at the level of each individual SEG certificate holder has a positive net impact on eel populations. Traceability of the fish throughout the supply chain is an essential part of the standard scheme and will contribute to the elimination of the illegal trade. The SEG Theory of Change makes explicit how we expect our strategies will lead to the expected outcomes and how these outcomes contribute to impact. The Theory of Change highlights the pathways to achieve change to achieve our mission in the long run. Our Monitoring and Evaluation system will be based on the Theory of Change that enables us to test the causal pathways and monitor progress towards the objectives. Lack of progress will trigger further analysis to identify whether strategies need to be refined. Monitoring and Evaluation at SEG will not be an academic exercise, but a management tool for providing information on what is or is not working. Healthy eel populations, distributed throughout their natural range fulfilling their role in the aquatic environment and capable of supporting sustainable exploitation for the benefit of local economies. To be the respected partnership that enables and promotes the joined up conservation and management of the eel in the UK and Europe, linking all interests in an open and effective process. SEG has adopted and works to the United Nations Brundtland Definition. This slide is taken from the Chairman’s presentation to the Venice Conference. The issue of eel sustainability is further examined in the introduction to the Sustainable Eel Standard.